Need your help. There are 4 things I don't understand about the score cards. 1. For Hole No. 1, why is it that the HDCP difficulty for red tee of "1" is more difficult than Blue/White tee of "11"? Since Red and B/W tee are the same hole but different distance, shouldn't the HDCP difficulty of "1" be the same for both Red and B/W? Hence for hole 14, both Red and B/W tee should have the same HDCP difficulty of "2". No??? 2. The ratings/slope numbers, how do these numbers affect your final scores? or the numbers are there to inform the players the difficulty of the slopes only? 3. What does the red dots mean? 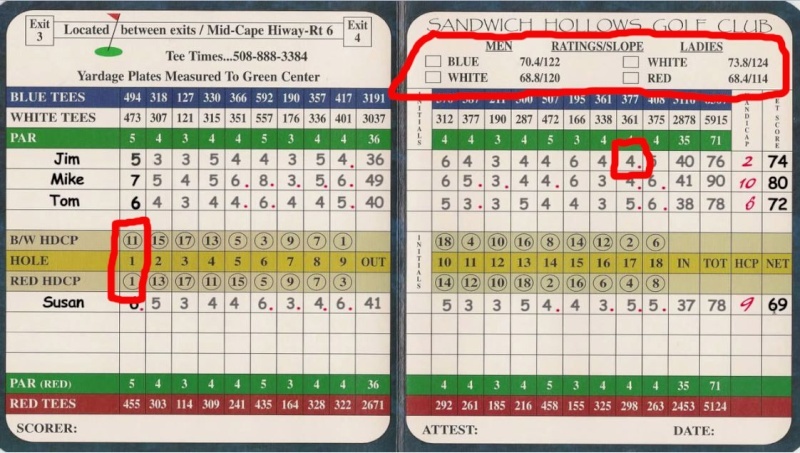 eg: Jim has a handicap of 2, so his score cards shows the red dots for hole 9 (HDCP 1) and hole 17 (HDCP 2). The video says that Jim got a stroke for both hole 9 and 17 which he did pretty well for both holes. What does the red dots mean? and what does it mean "Jim got a stroke"? 4. "Out/In" are subtotals for 9 and 18 holes, but what does "out/in" really mean? 1. Not neccessary. Eg. the placement of the tee box can affect the difficulty of the hole. For instance, Par 3 hole. From blue and white tee, you need to cross a big ravine before reaching the green. The difficulty could be say 2. But if the red tee is place on a location whereby the path to the green is not blocked by any obstacles, then the difficulty of that hole is reduce drastically. I encounter this in Shenzhen Wind Valley one of the par 3 hole. 2. The course rating and slope rating are both used to derive the handicap differential used to calculate your USGA handicap. Also slope rating is used to derive your course handicap. The course rating calculation sounds complicated, guess I leave the computers at the clubs to calculate and track our handicaps. Bro, hcp calculation is actually quite simple.